Dads are so great. You play, you provide, you nurture, you support. Often, dads find that they love their children more than they ever thought it was possible to love. And yet, I think it’s safe to say that most new fathers are in for a shock. No matter how ready you try to be, you are likely to feel overwhelmed and lost in this new territory of parenting. Tensions with partners often flare during the early years of parenthood as well. Even when a man wants to be a respectful, equal partner in the relationship and in parenting. Even when the relationship is strong and committed and wasn’t overly stressed before the baby came. Becoming a father puts men into a new world where emotions and relationships are prioritized in ways they usually haven’t been prepared for. It’s not any new father’s fault, but understanding this can help men to develop the skills to survive and flourish as a parent. Very broadly speaking, men in our culture are taught from a veryyoung age not to experience emotions. “Be tough, don’t cry, bestrong.” Men are taught to be very logical, men are taught to focus on financial issues, practical issues. So there’s this whole other world that a lot of men are not exposed to: the emotional world, the relational world. These are the skills that are requiredof men when they enter this new phase in their lives. They have to understand their wife in a new way, they have to understand their children as they become older. 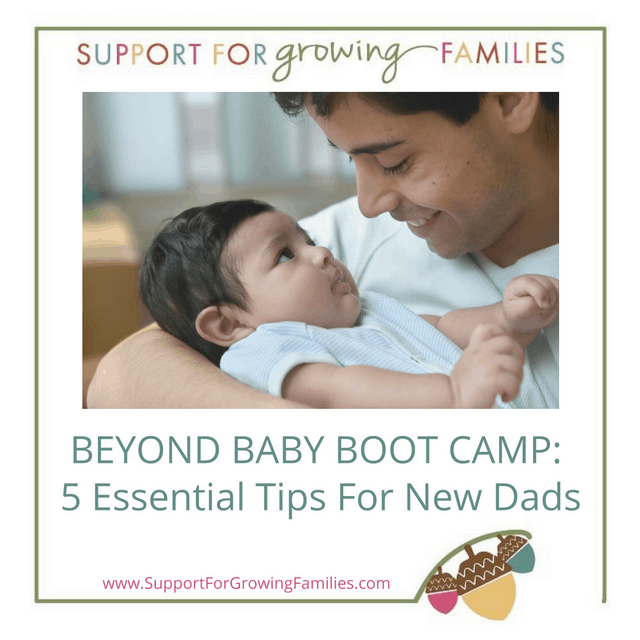 Here are some suggestions, based on my experience as a doula, to help new fathers adjust to the tremendous changes that come with having a baby. First of all, both parents need to keep in mind that raising children was never meant to be done by just one or two people. Parents often become divided because of the pervasive myth that the work of parenting can and should be done well by one or two parents on their own without help. When parents don’t know, or aren’t remembering, that the work of parenting is more than two people can do on their own, there’s not much else to do but blame our partners for not doing their share. But, even after each parent has given 110% (whatever that looks like for them) the work still won’t be finished, and there will still be children needing your attention, jobs to go to, meals to prepare, and laundry to fold. When tensions flare because it’s time to get up in the night again with a baby or young child, when the house is a mess, or when it’s time to decide—again—who will give up their plans or take time off of work in order to meet the demands of parenting, it will help if you can remember that it’s neither your child’s or your partner’s fault, nor your fault (even though it can absolutely feel to parents that one or more of these things are true.) Whether you reach out for and accept help from family members, friends and neighbors, hire a postpartum doula or push through on your own, keep in mind that as parents in the United States, you are almost certainly parenting without enough support. Whatever balance you had in your lives before the baby is likely to be completely undone. However you divided the work, however you enjoyed time together and separately, it all changes. Although you probably knew it would, there was no way to prepare for how it would feel. Additionally, every family faces their own unique challenges. Sometimes breastfeeding is really hard. Sometimes babies need to spend extra time in the hospital, or there are complications in the mother’s physical recovery from the birth. Sometimes the extended family is more of a stress than a help, or visitors are burdensome rather than helpful. Sometimes a one or both parents are dealing with depression, or there are chronic health issues to deal with for one or both parents. The list could go on. I’ve seen many families where the couple felt like best friends before the birth, but the challenges of being new parents caused some intense conflicts to arise between them. Parenting with your partner will mean taking teamwork to a whole new level. But the game is constantly changing and different for every family, so you will have to write your own playbook. Learning what works for your family regarding sleep, sharing responsibilities and communication are all part of the adjustment to life with new babies. Minimizing sleep deprivation is important for both parents. I spend a lot of time encouraging new parents to focus less on how their baby sleeps and to treat sleep as a family project. I remind them that as adults, their sleep patterns are a lot more flexible than their babies’ are. The happiest families I see in the postpartum period are the ones who understand why babies sleep the way they do, and go with the flow rather than trying to change their babies. Even when families understand how babies sleep, they often don’t prioritize their own rest because of the pressures to get right back into their pre-baby routines. The lack of paid leave is a huge culprit here. Remembering to prioritize rest and sleep in the first six weeks is something that most families need help with. When you have a new baby, sleep and rest are not just for nighttime anymore. Encouraging your partner to take it easy during her postpartum recovery is one important way to support her. Also, remember that caring for a baby and recovering from birth are work! I knew one mother whose husband come home from work each day and looked around the house at what wasn’t done, either silently surveying or occasionally making comments. He may not even have been aware of what he was doing, but in one silent glance, assessing the appearance of the house first, he invalidated all of the work his partner had done that day to care for their children and herself. Try not to be that father. It’s important to focus more on the well-being of the children and your partner than which projects or housework get done. What else works for maximizing sleep? There is no one-size-fits-all family sleep strategy. I’ve seen many different strategies work for different families. What works for your family is key. I’ve seen families where the parents sleep in different rooms, where the baby is next to the adult bed, or in a separate room, or in bed with the parents. Sleeping separately doesn’t mean there is anything wrong with your partnership. I worked with a family who settled on having the mother care for the baby throughout the night, while the father slept in a guest bedroom. Their only rule about this was that the father was never allowed to say to the mother that he was tired. This family also arranged for help during the day so that the mother almost always got a nap. Another mother found that sleeping on a futon on the floor with her twins in the nursery worked best for her. When there was help at their house during the day, she encouraged her husband to come home also, so that they could both take advantage of the opportunity to nap. Other families take shifts at night. If the baby is taking a bottle, then getting a longer stretch of sleep by agreeing that each parent can sleep through at least one feeding, while the other wakes to feed the baby, works for many families. Co-sleeping is another family sleep solution that families historically and globally have found to work well. In fact, about 80% of families say that they co-sleep at one point or another. It’s important to understand what exactly the risks are, and also that it is possible to co-sleep safely. In order to co-sleep safely, consider first the risk factors which would indicate your family should not co-sleep: formula use or anyone in the household being a smoker or using narcotics. Co-sleeping is safest in a firm bed with no gaps between the mattress and the wall. Sleeping with a baby on a couch or chair is much more dangerous and should be avoided. For more information on safe co-sleeping, see Dr. James McKenna’s article “Safe Cosleeping Guidelines,” from the Mother-Baby Behavioral Sleep Laboratory at the University of Notre Dame. You or your partner may feel at times that you are not rising to the occasion of fatherhood quite as you hoped you would. But you can do this! New fathers are often told to “help” or “support” their partner, but not often given good guidance about how to do so. It’s okay if you aren’t sure what to do. But you can find out. If you are fortunate enough have experienced women helping your partner–grandmothers, sisters, friends or a midwife or doula–take time to notice what they do to support your partner. Ask them, or your partner, for suggestions about what to do. You can learn how to help position the baby for breastfeeding, or how your partner likes pillows arranged to support the baby or her arms. Or, ask what sort of snacks and drinks she would like to have available where she is nursing, and keep it stocked. If you have to go back to work, find out what sort of snacks or lunch you can leave for her to make healthy eating easier while you are gone. Having primary responsibility for some aspect of infant care is helpful for bonding with your baby as well as supporting your partner: diaper changes, bath time, nail trimming, etc. Ask your partner what her priorities are. Asking other fathers what worked for them is another good approach. While maximizing sleep is important, there may also be times where the emotional and practical support provided by both partners being up to care for the baby together is important. Being the one to change the diapers as needed, or to soothe the baby back to sleep can be a great way for a father to bond with the baby and to support breastfeeding. You are a key person in your baby’s life, sooner, and more deeply than you may realize. I have seen many times, shortly after a baby is born, when the baby is taken away from the mother to the warming table across the room for one reason or another and begins to cry. If the father is there and speaks to the baby, there is an immediate relaxation and the baby turns toward the familiar, safe voice of the father. It’s a beautiful testament to the key role fathers play but, sadly, many fathers don’t realize at first how important they already are to their babies. In fact, part of what makes being a new father so challenging for many men is to learn that simply being present is often what is needed by his family. Sometimes there are tasks to accomplish, and concrete problems to solve, but other times your caring presence is what is most required. Listening to a woman who is going through the baby blues in the first weeks postpartum without giving advice or trying to make her stop being upset; turning off the tv and enjoying eye contact with your child when he or she is bottle feeding or quietly alert and gazing into your eyes, those are actions which mean the world to our families but which men may not have gotten much reinforcement for. The rewards of strengthening one’s ability to be present with others are tremendous. Ironically, the transition to parenthood also changes your partner’s ability to be there for you emotionally. So, while you may have to step up your game with partner and children, you may also need to add some new ways of getting emotional support for yourself. When a woman is sleep deprived, physically recovering from giving birth, working to establish breastfeeding and understand the baby’s cues, and essentially overwhelmed in one way or another by the new responsibilities of motherhood, she just does not have the same time or patience for you as she did before. No matter how smooth or rough your transition to fatherhood is, you will benefit from connecting with other fathers. Now you are in a club you may not have known existed before. If you are used to relying on your partner as your best friend and sole companion, you will need to branch out–she cannot be there for you in the same ways now that you and she are also caring for a baby. Once at a birth, I heard two fathers connect in a hospital hallway. One’s baby had just been born earlier that day, the other man’s wife was in labor. They talked for less than a minute, but the “experienced” dad helped to prepare the expectant father for what was coming during the delivery. It’s common for birthing women to sound short-tempered or impatient as they transition and the end of labor, and ”Don’t worry about anything she says,” was the advice which the new dad gave this expectant father to help him approach the birth of his baby with greater confidence. 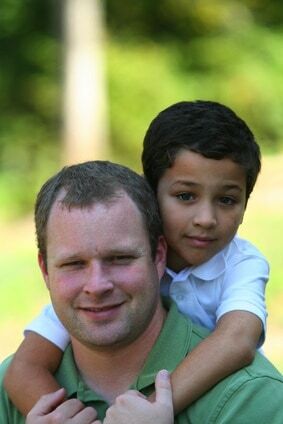 Talk with other fathers at work or school or your place of worship, or find an online group–Ann Arbor has a Dads’ Facebook group “Ann Arbor Area Dads” you can join–these other dads will understand what you are going through and may have good suggestions for dealing with the challenges of new fatherhood. If you are really struggling, you may want to consider some counseling. With so much change happening, sometimes our old strategies for managing life need to be enhanced or replaced with new ones. Even when the baby is doing well and your partner seems to be managing the transition, you–the good, kind, thoughtful, sensitive man your partner chose to have a baby with– may now feel out of your depth and you or your partner may feel at times that you are not rising to the occasion of fatherhood quite as you hoped or thought you would. But you can do this! For one thing, it usually feels like we are doing a worse job as parents than we are. And it’s normal to feel unsure at times as a new father, especially as you work out the new responsibilities with your partner. Talking about your needs with you partner can lead to conflict at times, but on the other hand, not talking about your needs at all usually leads to conflict later. Here is where you try to find the delicate balance of thoughtfulness about all that your partner is doing, and what she needs, and kindly expressing what it is that you need. A little more sleep so that you can function at work? A few minutes to yourself when you get home or a chance to exercise? A chance to connect with her without the baby? Some of these may be doable occasionally, but other times, it’s more a matter of being patient until the baby grows. Listening to your partner’s feelings and needs can also be challenging when there is upset directed at you. In the shift to parenthood, many women feel more anger and disappointment about their partner than they expected to. You may feel misunderstood, bewildered, inadequate, defensive or guilty, and you probably feel like you don’t understand what she’s so upset about. You are not alone. But try to listen and learn. Always going back to the reminder that the work is more than two people can reasonably do will help. Keep this in mind later too. For some lucky couples, things go fairly smoothly with the first child, but then having a second child tips the scales. One communication tip I’ve shared with couples are to say something you appreciate about each other every night before sleep. This can counter some of the frustration that comes from feeling disconnected and unappreciated. You may be exhausted and overwhelmed, but you can do this fatherhood and partner thing. If you are open to growth and change, you will be able to be a better father and partner than you ever imagined, and you will be able to enjoy it more, as well! Courtesy of the Crazy Wisdom Community Journal. This essay was first published in Issue #64, September-December 2016. www.crazywisdomjournal.com. Great tips! Especially the first one! Dads go through so much during the postpartum period and it is important that they feel needed and are cared for just as much as mom and the new baby. Thank you, Kelly! Glad you liked the tips.